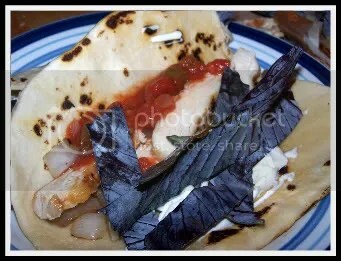 Skinless, boneless chicken breast, marinated in olive oil and Tony Chachere’s Original Creole for a couple hours, then grilled until char marks appear and the scent of spiced chicken wafts up from the plate and infuses the kitchen, then sliced into edible strips, easily placed on a tortilla blanket. Purple cabbage, washed, patted dry and thickly chiffonaded for a leafy, satisfying crunch. Shredded mozzarella (not pictured), sprinkled lightly under the chicken strips to melt and create a gooey, slightly salty bond between chicken and tortilla. Storebought salsa, spooned atop chicken for a mildly spicy kick of tomatoes, peppers and jalapeño seeds. What’s a taco without salsa? Sauteed, blackened Vidalia onions pieces (also not pictured), cooked in a seasoned cast iron skillet with a pinch of salt and brown sugar, browned to a floppy, flavorful, juicy mess and strewn under chicken and cabbage, over shredded cheese. Soft on the outside, still maintaining a gentle al dente bite. 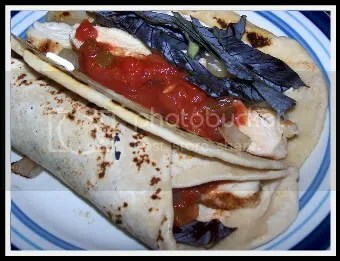 Sour cream to melt around all these things and bring the flavors together, a creamy, tangy base of a self-created taco sauce, wherein all the juices of grilled chicken, fresh cabbage, tomatoes, peppers and melted cheese come together in celebration. Homemade white flour tortillas, mixed, kneaded and flattened by hand, with love, and set to brown on a searing-hot iron skillet, still infused with onion and brown sugar, then removed and let cool for packaging by hand.